We have developed trolleys for the cumbersome jumbo (big) cylinders as well as small cylinders. 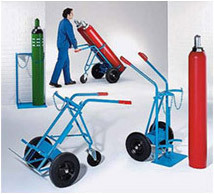 These hand trolleys are specially designed to hold and easily transport heavy compressed gas cylinders by persons of moderate strength. They feature arc welded tubular steel construction for strength. All models roll quietly and smoothly on large solid rubber tired wheels and castors for better maneuverability over rough or even surfaces. Trolleys are finished with scratch resistant, high gloss, electrostatically applied oven baked powder coat.